Arrive in Istanbul and board your flight to Kayseri. Arrive Kayseri airport and transfer to Cappadocia. Arrive in Cappadocia and check in at the hotel. Rest of the day free for leisure. Overnight stay at the hotel in Cappadocia. Early pick up time. Light breakfast with tea, coffee, and some cakes. 1h duration of the flight. Celebrate the flight with champagne after landing as the first balloon rider did. And flight participation memorial honoured certificate. 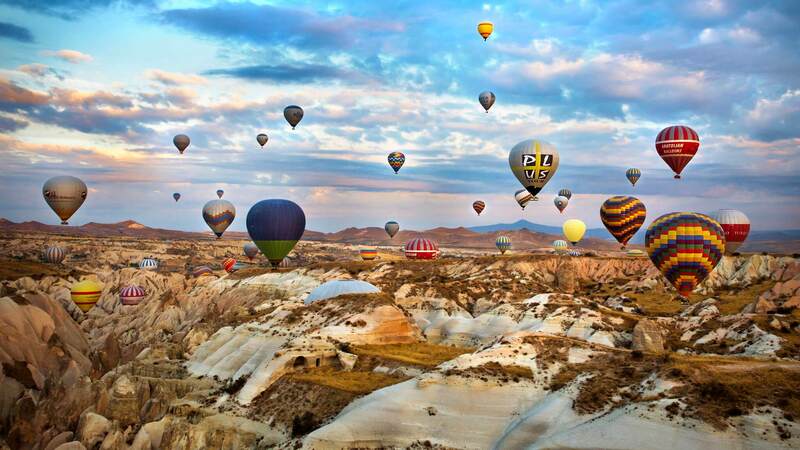 Highlights – Contemplate the valleys and landscapes of Cappadocia at sunrise – Enjoy a light breakfast before taking to the skies – Celebrate landing with a glass of Champagne Fly over one of the most spectacular landscapes in the world with a magical hot air balloon ride over Cappadocia. Take to the skies and rise high above the honeycomb peaks that characterise the unique landscape of Cappadocia. Enjoy a half day afternoon tour of the northern part of Cappadocia which is the most beautiful part of Turkey`s visually most amazing region . You will begin your discoveries with a visit to the “Goreme Open Air Museum” which is a UNESCO recognized the medieval monastic complex of painted cave churches and dwellings, carved out of the tufa rock by the Christian monks. You will finalize this dream-like afternoon with a visit to the “Uchisar Rock Castle”. Upon climbing up we view the fairy-tale like Goreme Town from a bird eye’s view which from all angles provides great photograpyh. You will also see some of world famous Turkish Handicrafts being made here. After the tour transfer back to the hotel. Breakfast at the hotel. Check out from the hotel. Transfer to Kayseri airport and board your flight to Istanbul. Arrive in Istanbul and check in to the hotel. In the evening proceed for the Bosphorus cruise with dinner and entertainment. An enchanted night cruise starts while you sip your welcome drink as the sun sets on Istanbul. Beneath the Bosphorus Bridge by moonlight, glide past the Ciragan Palace, nowadays Hotel Kempinski, Dolmabahce Palace on European shores and the Beylerbeyi Palace, Kanlica and Anatolian Fortress on Asian shores. A rich variety of open buffet dishes, specialties of Turkish Cuisine and BBQ, unlimited local drinks. The twinkling lights of the European shores from Tarabya to Bebek. Transfer to hotels. Overnight stay at the hotel in Istanbul. Breakfast at the hotel. Proceed for the tour. We start the tour with a visit to the magnificent Byzantine church of St Sophia; one of the finest architectural works in the world, this church has been nominated as the 8th wonder of the world by many historians. Then continue to the Blue Mosque, one of the largest mosques in Istanbul. Dating back to the 17th century, this is one of the principal adornments on the skyline of Istanbul and is also famous for its blue tiles and 6 minarets. Breakfast at the hotel. Spend the day at leisure, shopping and relaxing. Check out from the hotel. Afternoon at leisure. Proceed to the airport to board your flight to Delhi. Straddling Europe and Asia, Turkey is an exotic travel destination with a rich history and culture. Natural attractions as well as man-made marvels can be found here in plenty. It is a fine example of the architectural brilliance of medieval period. Turkey offers snow-capped mountains, scintillating seas and other water bodies, colorful market, architectural marvels and a number of objects of tourist attractions. Experience a truly enjoyable holiday in the country with our Turkey Tour Packages from India. Moreover, Turkey is a suitable travel destination not just for holiday making and vacations but you can also find it a wonderful location for a good honeymoon trip. Turkey is fast gaining popularity as a fine holiday destination all across the world. This exotic place is so rich in culture and traditions that you are sure to get spellbound with its charm. Besides sightseeing, you can do a lot to activities here to make your trip completely enjoyable. Book one of our Turkey holiday packages from India and enjoy mountain climbing, hiking, biking, scuba diving, sight seeing and more at this stunning location. Discover the land and its great history dating back to 10,000 years, take a close look at monuments that are placed under world’s best and witness its year round festivities and events. Ankara: The capital of the country Ankara and a popular tourist destination. Find here museums and a number of attractive tourist spots. Antalya: A coastal city lying on the Mediterranean Sea, Antalya is just fabulous. Find here an exciting range of water sports that include scuba diving, swimming and snorkeling. There are mountains as well here, which offers you yet another kind of sports activities, such as mountain climbing and hiking. Istanbul: A unique city straddled between Asia and Europe, Istanbul is known worldwide for a rich cultural heritage and beautiful architecture. Also find here some of the best pubs of the world. Adana: Known as The City of Gold, Adana is a hub of jewelry business with a large number of shops selling exquisitely designed gold jewelries across all corners of the city. The fourth largest city of the country, it is also known for ancient mosques, which are still standing tall. Aya Sophia: Built during Byzantine period, probably in the year 536, this magnificent building will leave you gaping in wonder. Previously known as Hagiya Sophia, it is the largest dome of the ancient world. For many years, it was known to the world as the largest church of the world, but now it has been converted into museum. Blue Mosque: A splendid piece of beauty, Blue Mosque looks stunning with its blue tiles and as many as 6 minarets and 16 balconies. The mosque has 260 windows that keep the inside well illuminated during the daytime. Grand Bazaar: A colorful market with over 4,000 shops selling a variety of goods and articles. You will just love to visit this bazaar and buy some items to take back home. Topkapi Palace: The royal palace that was once home to the Ottoman emperors. The architecture of the palace will keep you spellbound for a long moment.